You’re invited to join the Rev. Al Sharpton and many others to pay tribute to the legend this afternoon. 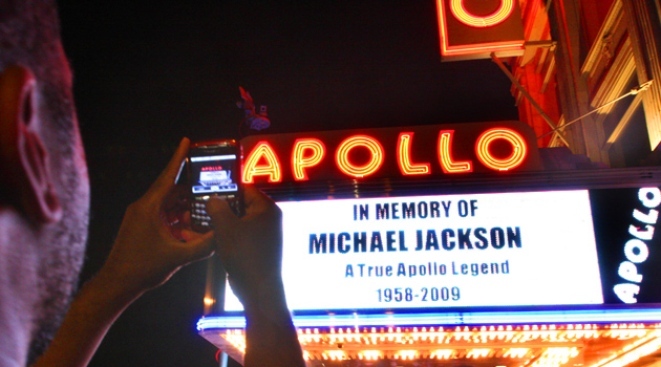 Harlem's Apollo Theater pays tribute to Michael Jackson. To hear the lore, you’d think Michael Jackson and his brothers sprang from the womb onto a national TV set, harmonies tight and moves in place. But the kids were once just a bunch of hopefuls playing Amateur Night at the Apollo. And yeah, they won. Jackson alighted at Harlem's Apollo Theater many more times throughout his life, and today, one of the world’s greatest stages will honor one of the world’s greatest performers with an afternoon of tributes. Starting at 2PM, Reverend Al Sharpton will be on hand to eulogize Jackson, and a video valentine to the singer will be played all day long. Expect lots of special guests to stop by to bid the legend a fitting goodbye. Find out more about the Michael Jackson Apollo Tribute at Time Out.